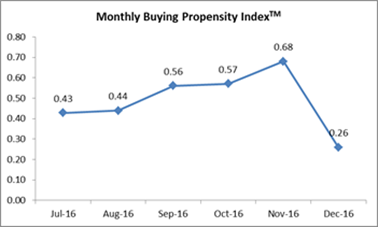 India, 11th January, 2017: India’s Buying Propensity IndexTM (BPI) in December 2016 stood at 0.26, (measured on a scale between +1 to -1), down 0.42 BPI points from November (0.68). The period of November and December has been characterized by just a single event -- the demonetization of high-powered currency notes. The Buying Propensity Index is a result of a primary research across 3,000 consumer-influencers across the 8 Tier –I cities in India conducted every quarter. 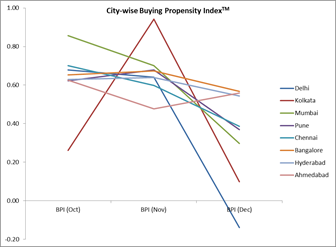 Considering the 8 cities studies for the BPI, Delhi was most severely impacted with a month-on-month fall of 122% in citizens’ keenness-to-buy, registering a negative sentiment in December at -0.14. This was followed by Kolkata with a BPI fall of 90%. The three cities which showed a medium fall in BPI were Mumbai (-58%), Pune (-46%) and Chennai (-35%). The cities which had a lower negative impact of demonetization on BPI were Bangalore (-16%) and Hyderabad (-15%). Ahmedabad was totally contrary to the BPI of the other cities, falling from a high 0.63 in October to 0.46 in November. The Buying Propensity Index (BPI) is a measure of the existing buying sentiment or ‘keenness to buy’ of India. The current Index represents the months of October, November and December 2016. The Buying Propensity indicator is a detailed analysis of three factors: the Transactional and Aspirational Buying Sentiment of the Indian consumer along with the Environmental Buying sentiment of the country. The BPI value can range between -1 and 1 ranging from a completely Negative Sentiment to a fully Positive Sentiment. TRA Research, a Comniscient Group company, is a Data Insights and Brand Intelligence company dedicated to understand and analyze stakeholder behavior. TRA Research’s Buying Propensity Index is a syndicated study which surveys 3,000 consumer-influencers across 8 cities in India conducted every quarter. Buying Propensity measures the Transactional, Aspirational and Environment sentiments towards making buying decisions and is a direct measure of propensity to buy. TRA Research also publishes The Brand Trust ReportTM and India’s Most Attractive BrandsTM.